This post started when I in a recent game, looked at the respective fleets of me (PHR) and my opponent (UCM). I had three Orpheus and an Achilleus (who all have heavy cruiser hulls) combined with an Ajax and and Ikarus and I was wondering – how much tougher is my fleet than his? This post attempts to delve into that matter. As for my bomber analysis, I also here run on averages and hence have some simplifcations. I will not repeat them here just mention, that they are there. I also do another assumption which I am somewhat uncertain of. I make an assumption about how many of hits that are criticals and how many are normal hits. This is in reality a very harsh simplification as this probably can vary quite a lot for game to game, fleet to fleet and list to list. An UCM cruiser-heavy list have a lot of 3+ locks whereas PHR broadside- and bomber-heavy list will tend to do a lot of 4+ and 2+ locks. In the end – after a lot of deliberation – I ended up on 35 % critical hits – a little more than a third of the hits. That means that I assume that the average lock roll when firing at other ships are a little better than 4+. Another assumption is about crippling rolls. I assume that a crippling roll will cause 1,75 hull damage on average. This is rather simplified matter since it can go from 0 to infinity, but the average should be 1,75 taking into account the theoretical infinite amount of rerolls with diminishing (average) returns. Assuming that hits are distributed with 35 % criticals and 65 % normal hits and that one crippling roll will be rolled (for ships with hull 4 or above) how many hits do you need to destroy any given ship? This was a number from 1,28 (Glass-class) to 35,74 (Minos- and Heracles-classes). Again assuming as above, how many points do you pay to be able to withstand 1 hit? Lower is better. This number ranges from 5,00 (voidgate with shields up) to 16,75 (Amethyst-class with shields down). Once again build on the same assumptions, how many hits can you soak for 100 points worth of ship in this class. Or alternatively, How many hits do you need to cause on ships of this class to kill 100 points. Better is higher and the classes in the highs and lows are the same as in the “point per hit” class. It is basically the same indicator but in reverse to easy different types of comparisons. Finally, I am operating with 5 fleets in this analysis. The fifth fleet is not some new alien race but due to Shaltari having two entries – one without shields and one with shields. With this tool in hand, I can make some analysis. Which fleet is the toughest? The answer is rather straight forward and not in need of this kind of – unless you a facing a disproportionate high amount of criticals, PHR almost universal 3+ armour save and extra hull points are hard to compete with. Number of hits to destruction normalized against Shaltari (no shields). Unsurprisingly, PHR ships across all designations can sustain around 68 % more damage than the weakest, shaltari. This is especially clear in corvettes (132 % more!) and frigates (99 % more) but also light cruisers and cruisers (including the troopships with heavy cruiser hulls) display this clearly. In the heavy cruiser and battle cruiser categories this is significantly less. So in short, for PHR to use their durability advantage, they need to look more to the smaller designations than to the larger. The order is clear across all ship designations; PHR – Shaltari (Shields) – UCM – Scourge – Shaltari (No shields). What if you factor in cost of ships? So, where do you get most durability for your points? If I want to view this across ship designations, I average out each designation since the cost vary quite a lot (especially for the frigates). The picture does not change dramatically, though. See the chart below. Number of hits to destruction per point normalized against Shaltari (no shields). What we see here, is that while PHR is still better, they are not supreme in all categories. Their corvette is expensive so they lose some ground here. In the cruiser category UCM is catching up, but this is mainly due to the Madrid-class being so dirt cheap and the same is the story behind UCM in battleship class. In general, UCM do catch a bit more up on Shaltari (shields) but other than that, the picture is not that different. So PHR ships are basically around the same cost than the other fleets? This came as a surprise to me – but yes. See chart below (Shaltari is only on this chart once since the prices are the same irrespective of shield use). Ship cost average on a designation per fleet compared to average in the designation. Or in short – are my frigates more expensive than all other frigates? 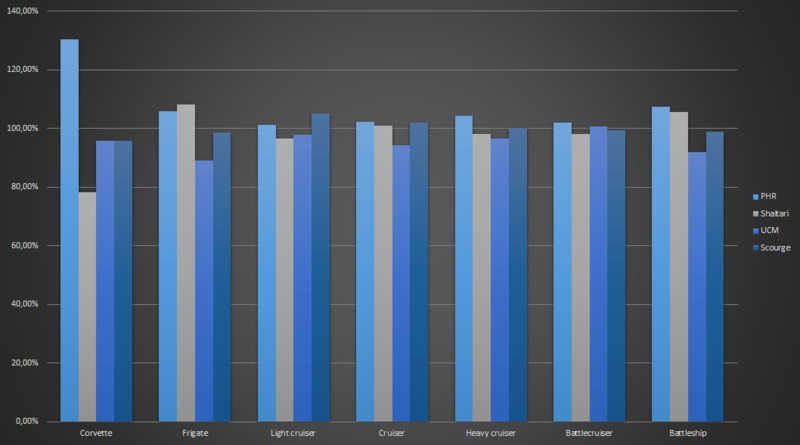 PHR ships are around 3,5 % more expensive than average – with corvettes being the big outlier and the difference in general is not that great. Unsurprisingly, PHR is more durable than the other fleets – also per point. This is especially obvious at frigate and cruiser designations. In a typical fleet, how much more durable is the PHR fleet? In the above analysis I assume an equal distribution of ships. In reality, that is not the case. So what if you take some sample fleets and compare? Which ships look tougher than they are – and vice-versa? The hull points are supposed to give you an idea of how durable a ship is (when factoring in the armour). But due to crippling hits and how armour and shields fare against critical hits, this number is very misleading. I will look into these two questions in future analysis.